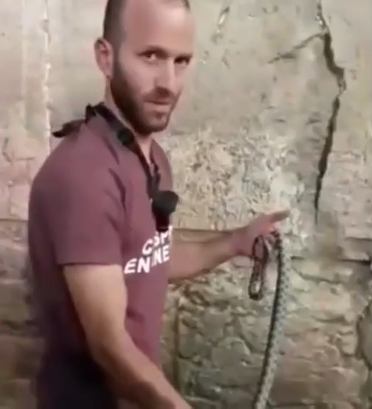 Days after a snake was removed from the Western Wall, I think I know what the message is. The "Snake" is alive and well and living in the very midst of the holiest portion of the Jewish community. And it ties in very well with the massacre of Jews in Pittsburgh. I'll try to explain. In Gan Eden the Snake told Chavah that HKB"H did not want her to eat from the Eitz Da'at Tov v'Ra because He knew that the moment she did, she would become a god also. It was, of course, a lie, but all of human rebellion against the laws and commands of HKB"H from that moment until this one has been done in this quest to "realize the god within." And it has reached even into the holy communities of Eretz Yisrael! The Western Wall/Temple Mount represents Jerusalem - the place from which our prophets said the Torah would go forth to the world. Today, to our great sorrow, this rebellion against HKB"H and His Holy Torah has been launched even from the beating heart of Torah Judaism. The Snake's Big Lie is being spread throughout the world from many self-proclaimed "Orthodox" sources originating in Jerusalem. They say everyone is entitled to his "own truth" and that this truth is found inside each one of us. What else is that except man becoming his own god? Each person becomes the source of his own "truth" and in acknowledging that, as well as everyone else's "right" to "their truth," all personal accountability and mutual responsibility ends, God forbid! You must be made aware so that you can, in turn, warn others and thereby build a protective hedge around the innocent and the righteous. ...Dror Moshe Cassouto was born in Jerusalem, and grew up in a Jewish secular family. He studied for a few years in a high school for the arts, traveled around the world, and then drafted into the Israeli army, where he met his wife.... They were married around a year after meeting, and began, together, their return journey to a religious life. ...Dror studied at the Belz yeshiva, Yeshivat Aish HaTorah, and finally at Yeshivat Chut Shel Chessed, the yeshiva of Rabbi Shalom Arush. ...Dror remained there for twelve years, and relocated to the Beit Yisroel neighborhood adjacent to the yeshiva. He illustrated and helped to publish the famous children’s books written by Rav Arush. ...Dror also wrote several books and CD’s for children, and founded an English program at Chut Shel Chessed, which he managed and coordinated for five years. Finally, with Rav Arush’s blessings, ...Dror founded the Emunah Center in the Rechavia neighborhood of Jerusalem. The Emunah Center, which also has the Emunah Channel website, is an outreach center for Jews all over the world. Whether in Israel at the actual Emunah Center, or via the Emunahchannel.com website, thousands of students enjoy the beautiful and inspiring wisdom that ...Dror teaches daily. ...Dror lives in Rechavia, Jerusalem with his wife...and their five children. The Pittsburgh connection (promised above) is covered in Part 2. The same thing happens with Rabbi Winston’s audio shiurim on Arutz sheva. I wrote to the editor but nothing changed. I think perhaps its where these shiurim are stored at an offline agent, the link cuts off. Rabbi winston sends me a download file that is only available for a short time then it’s not available again. Please make it clear that this cassuto is a fake rabbi and not to listen to him. It’s not so clear that’s what you mean. Tizku l’mitzvot. And another thing, 'everyone's a rabbi - all you have to do is grow a beard and long peyot! All of these fake rabbis and falsities were all predicted by our great Sages and Prophets, but it is very hard to digest all these insanities. The real problem is that there are so many who don't know any better and start believing them. Truly, an era of complete chaos! Hope we can all hold out and still keep our sanity. Yes, anon, the Vilna Gaon explained who these confused representatives are. And Rav Richter excellently tells us the Psak of Rabbi Moshe Feinstein in these matters. Must listen to both shiurim.